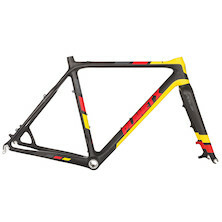 Cyclocross bike frames are lightweight yet strong; stiffened and beefed up from their road bike cousins and capable of handling muddy tracks, rocky sections, and a general off road thrashing. 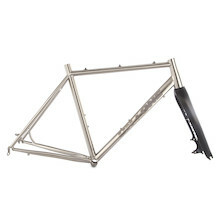 Retaining a similar (though slightly more upright riding position) geometry to a road bike, the extra clearance and comfortable ride that these frames offer makes them highly suitable for touring, commuting and urban use as well as the race environment for which they were originally designed. Our UK distribution of Italian cyclocross frame masters Guerciotti expands your choice further, with a range of capable machines that compliment homegrown Planet X and On-One models.